By LUDWIG VON KOOPA - Ominous clouds, eh? Get ready for mudslides. Today, The Pokémon Company International is trying to play weather forecaster. 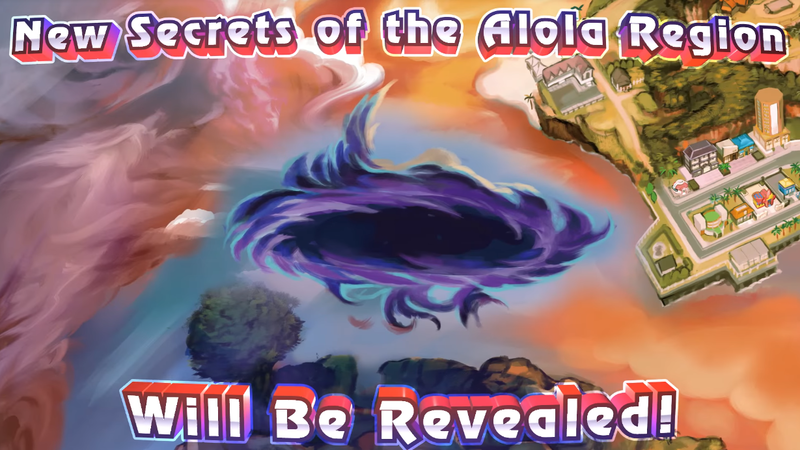 They project dark, ominous clouds over the Alola region this November, specifically for Pokémon Ultra Moon and Pokémon Ultra Sun. Here's a video of the forecast... well, most of it is about Rockruff and Lycanroc for some reason. I'm sorry, but if their reason for buying a sequel or pseudo-sequel or remake or whatever the hell this is of Pokémon Sun and Pokémon Moon is a dark cloud, irrelevant and lame rock dogs (seriously, Lycanroc better not be the new Lucario because it sure ain't worthy), and some ebony dude who I still have never heard of (Necrozma), there's no purchase from me. Oh, but wait. There's MORE to Ultra Sun and Ultra Moon than just clouds and new clothes. There's the Alola Photo Club! My take on the Alola Photo Club? Well, its purpose is to get screenshots saved to your 3DS's SD card, which you can then use for Swapdoodles, I guess. Previously, you could only get screenshots at specific Photo Finder points, with specific Pokémon. There was no Miiverse functionality for Pokémon Sun or Pokémon Moon. Somehow, I get the feeling there won't be for these Ultra versions. Unfortunately, no one uses Swapdoodle, so the whole thing is a waste, even if you can pose your trainer in the Z-move dances. Speaking of Z-moves, there will be new, highly Pokémon-specific individual Z-moves, but... so what? All that'll do is move Necrozma up a tier or two in competitive Pokémon battling, along with some other Pokémon like the difficult-to-get Kommo-o. Not a reason to buy anything new. There will be new secrets that will be revealed, but is it worth the price of admission? At the beginning of this week, we told you what ominous clouds can do to a place. Constant clouds, and the rain that pours down from them, are likely responsible for the mudslides on Monday in Sierra Leone that killed hundreds of people. Right now, that dark cloud is above Poni Island. Poni Island has mountains and cliffs. If there was a mudslide there, it would encompass the whole island and kill everyone there. You wouldn't be able to escape because it's an island, similar to how the people of Guam are screwed in case North Korea launches nuclear missiles at them, even with a 12–14 minute warning. I sure won't pay $40 to die. The cloud is there. You know what's gonna happen. I'm sticking with cloud-less Pokémon Moon until further notice. Ludwig hasn't actually touched his copy of Pokémon Moon in quite some time. That's probably a really bad thing, though it might also be why Game Freak is even making these games. With any luck, ominous dark clouds means that a certain hated Alolan boy will be destroyed. There's actually plenty more new with Ultra Sun and Ultra Moon, especially in terms of Ultra Beasts. The darkness over Alola promises to be an Alola you don't even recognise. That's not true, though. Agreed, no reason to buy anything new--unless you're a competitive VGC player. I know someone who's SUPER excited for Kommo-o's new move. More reason to use Fairy types, then! So that's where the vortex subplot from Golden Sun: Dark Dawn went. Dark clouds. Hm... sounds relevant. Could it be the eclipse that never came to Hawaii? Don't forget about the solar eclipse of 1991! Why Is Angry Sun So Angry? Total Solar Eclipse! Go 🌒 Yourself, Fake News! Eclipse 2017—In The Path of Totality! Nintendo World Championships Return For 2017! Kirby Series: 25 Years Old! eShop Sale!